Popular Disney-themed sandbox game Disney Infinity —which melds physical toys with a virtual universe —is set to debut on the Apple TV, one of the first console games to make the jump to Apple's new set-top box. A $99 Star Wars starter kit is now available in Apple Stores throughout the U.S., Disney announced on Wednesday. 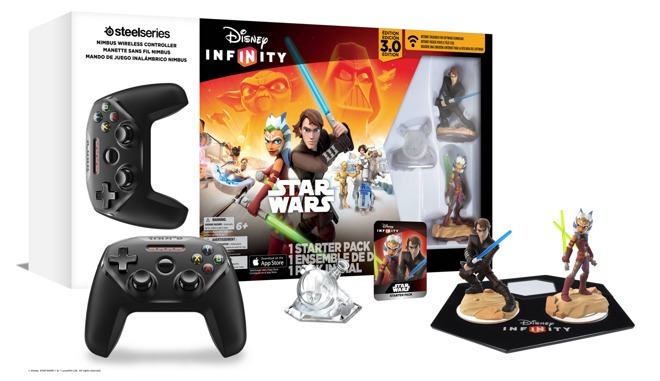 The pack includes a Bluetooth-enabled Disney Infinity base, as well as a Star Wars: Twilight of the Republic play set piece and Anakin Skywalker and Ahsoka Tano figures. "Apple TV represents an incredible opportunity for us to bring Disney Infinity to a new audience of players who may not have a game console in their household," Disney Infinity chief John Blackburn said in a release. "We're offering the complete Disney Infinity 3.0 experience on this device, optimized for Apple TV, and we're already planning new Disney Infinity experiences for the App Store." The starter pack also includes a SteelSeries Nimbus controller, one of the first third-party game controllers made available for the new Apple TV. AppleInsider looked at the Nimbus in October and found it to be a solidly-built accessory. Disney Infinity starter packs usually retail for $59, meaning buyers of the Apple TV version will receive the Nimbus for $40. That's an effective discount of $10 from the Nimbus's $50 price tag.